Drawings by Hollis Dunlap Opens Today!! Next Sunday SKETCH JAM and Drawing Show! 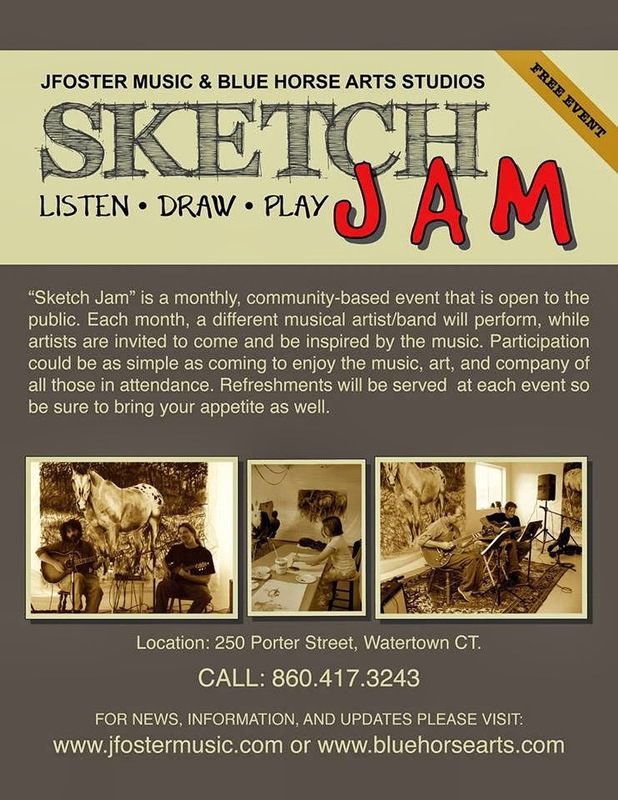 Our semi regular Sketch Jam will be taking place next Sunday! 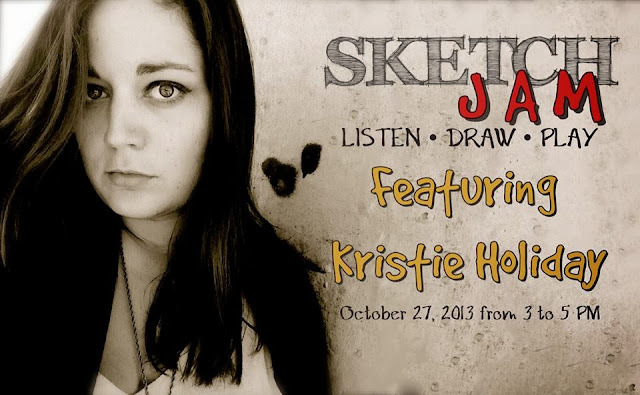 This Sketch Jam will featuring Kristie Holiday on vocals and Jay Foster on guitar! Well versed in both music performance and production, Ms. Holiday’s sultry, soulful, vocals are at home in a myriad of musical genres from Jazz to Country to R&B to Ska and much, much more. 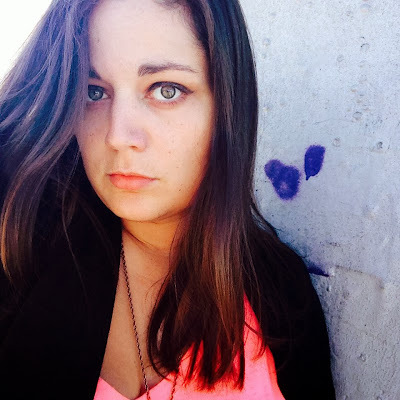 Kristie has performed on both sides of the proverbial “pond” at places like Jazz After Dark in London and Wally’s Jazz Café in Boston. 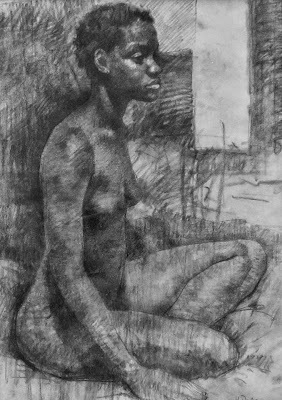 New London artist Hollis Dunlap will also be presenting a selection of his drawings which will be on view for a few weeks.Hollis will be giving a Figure Painting workshop at Blue Horse Arts on Nov. 9th and 10th. 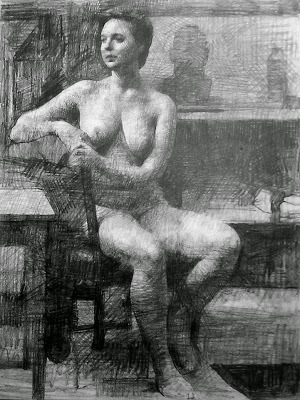 There are only one,possibly two spaces left for this Figure Drawing Workshop. So Sign up while you can!!!! Along with a nice opportunity to view Hollis Dunlap's drawings up close and personal this could also be one of the last chances we'll get to hear Kristie in the States for awhile as she moving to Great Britain next month! So don't Miss it ! 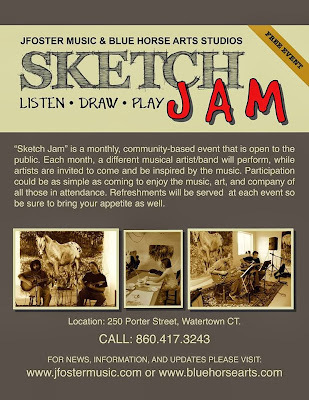 For the uninitiated, The Sketch Jam is a free musical event in which artists, music lovers, and the generally curious, are invited to come and draw, listen, crochet, or just hang out. So please come down and bring some friends on Sunday, October 27th from 3 till 5 pm. 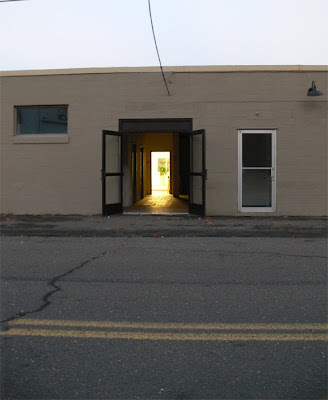 J Foster Music and Blue Horse Arts Studios are located at 250 Porter St. in Watertown. Call (860) 417-3243 for more info. P.S. We really love interpretive dancers;)! Lights, Camera, Action It's Peyton's Place!! You know I just couldn't resist this blog title. It's been a way busy week here at the studio. We thought we'd share a little of the behind the scenes film-making that took place at Blue Horse Arts and Jay Foster Music Studios in the early morning hours of Friday. ESPN producer Jalaine Edwards contacted us to ask if it would be possible to use the space as a set for the Peyton Manning Homecoming teaser! And of course we said that would be possible:)! The teaser will be airing tomorrow on the Sunday NFL Countdown at 10AM and then again at 11:55 ish in case you are sleeping in:)! 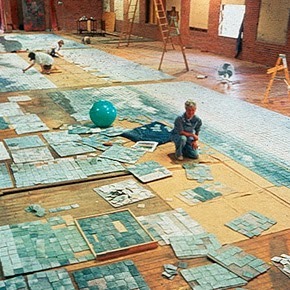 The teaser concept is staged as Peyton Manning's Art Gallery. So for the short time being "Field Projects" is Football Field Projects:)! Looking Forward to Jalaine's Magic of Editing in the Morning! WILL BE SHOWING RECENT WORK AT NEW ARTS PROJECTS THIS COMING WEEKEND! 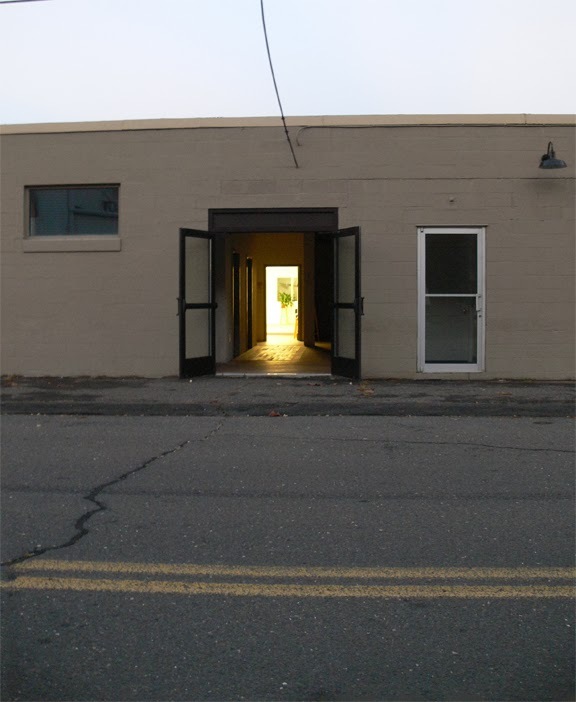 The opening reception is the Saturday, October 12th from 3-6PM. 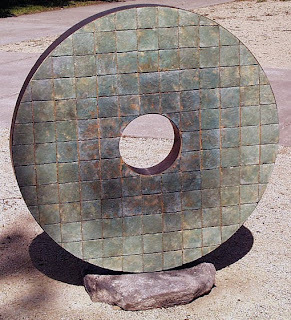 "With clay, I try to create the effects of intimacy and vastness through the use of fragmentation. Small surface elements draw the viewer into a larger context where hundreds of parts interact to form a whole. Marks of color, texture and layers of powdered ceramic stain are revealed as finished surfaces after the firing. 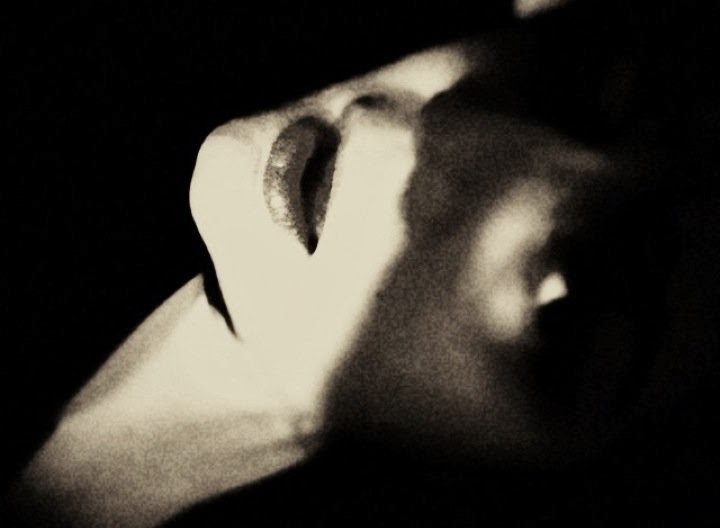 As I choose powders of one imagined hue to mingle with another, I know that every bit of pigment, though hidden in the powdered mixture, will affect the whole. Results of this initial process become the chaos of fragments from which I work. Each element becomes a discovery." 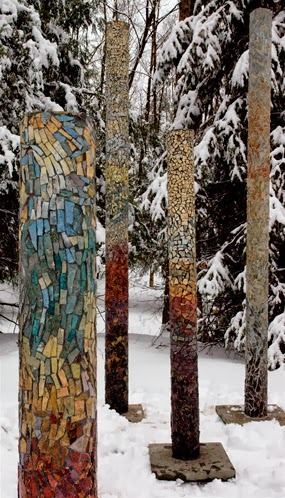 Aside from being a prolific artist in ceramic sculpture and painting, Elizabeth has been instrumental in organizing the "Rivers Alive" exhibition and lecture series hosted by the Washington Art Association. This exhibition and event project has been a collaboration with the Rivers Alliance and the Steep Rock Preserve. Please visit the WAA page to see more information on this project, future lectures,and the closing reception date. Check out this video for a glimpse into this artist's process. 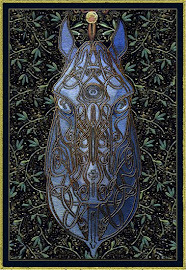 Please visit Elizabeth MacDonald webpage to view more of her work Here. 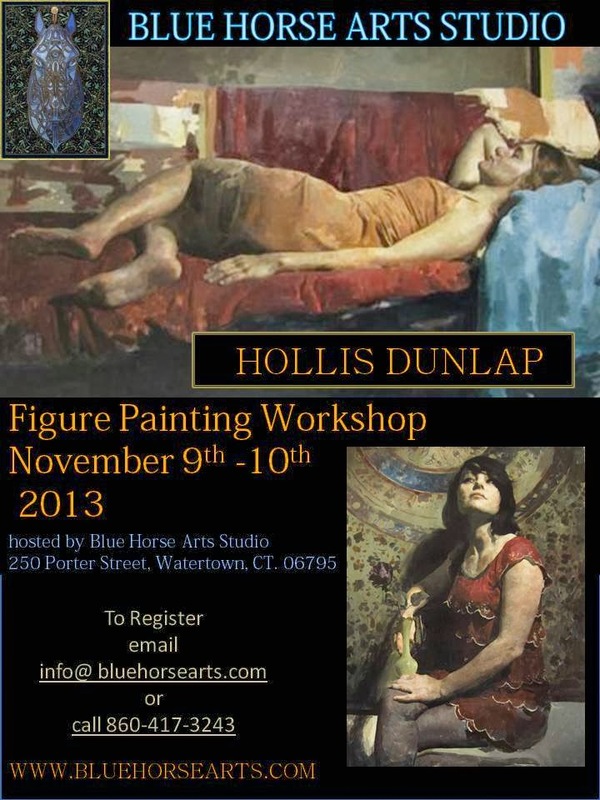 There are only a couple of spots left in the figure painting workshop with Hollis Dunlap that we are hosting here in November. It's going to be great, so reserve your space early! To Register please email info@bluehorsearts.com or call 860-417-3243. Pass it around:)!